Quiz question: where were these two photos taken? This entry was posted in Fun and tagged Bloggers, Clams. Bookmark the permalink. 7 Responses to Where in the world? The sign in the top photo is in English, with Spanish underneath. That strongly suggests west coast USA, probably California. 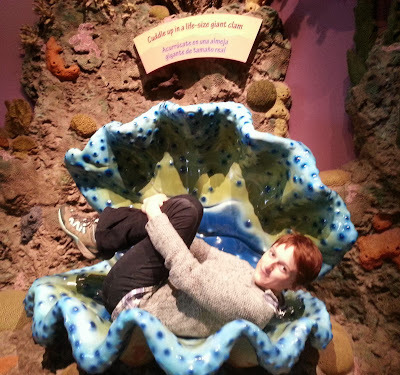 The obvious places for a fake giant clam there are Sea World in San Diego or Monterey Bay aquarium in, erm, Monterey. 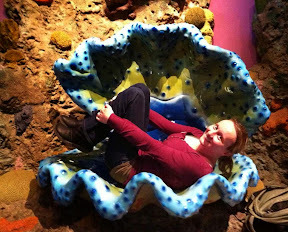 I’m going with Monterey Bay Aquarium because the rocks around the clam you are sitting in look like the walls they have in much of that aquarium. A bit of Googling and I’m convinced Mark’s guess of Monterey Bay Aquarium is correct, unless an identical cuddly clam is located somewhere else. Mark is absolutely right! I am impressed by your powers of deduction Mark. Maybe it would have been that bit harder if I had cropped out the sign. Many thanks to Eva who rose to my challenge to re-create the photo. Mine was taken in November 2012, a by-product of this trip, and Eva’s was taken last month. Although I know both Erika and Eva have been to Cromer, I knew it wasn’t there. Our giant clams are a different colour. I included my picture in my Finch and Pea blogpost and the aquarium tweeted the post, with the link to THIS post, so SOON EVERYONE WILL RECREATE THIS PHOTO. Maybe. Having been told that, its obvious that at the very least different camera settings were used in the two photos and therefore probably different cameras. The position of the camera in the bottom photo is also about three steps to the left compared to the top photo. If the photos had been taken one after the other most people would use the same camera with the same settings from approximately the same spot.